Last night I headed over to a wonderful friend’s house for an after-work play date. I wanted to bring something both the kids and us mamas would enjoy for dinner and figured mac-n-cheese would do – with a bit of a twist. 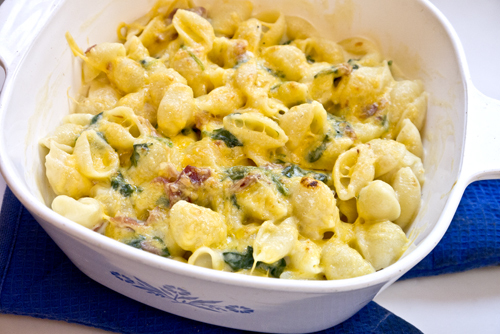 Adding some spinach and prosciutto would make things a bit more flavorful and special. Don’t be afraid of making homemade mac-n-cheese, it’s really easier than you think. And you can use whatever type of cheese you love best (along with controlling how cheesy you want it). Using whole milk ensures your sauce won’t get all clumpy and any shape or size of pasta works great. And, it was ready to go in less than 45 min. Start by boiling a big pot of water and dumping in your pasta. Any size or shape of pasta works wonderfully, but I sure like shells. Let the pasta simmer for at least 12-15, or until just cooked. While the pasta is boiling away, get out a saucepan and make the sauce. A béchamel is a traditional French cooking method for creating a lovely and rich milk sauce perfect for something like mac-n-cheese. Don’t be afraid of the fancy name, it’s really just simmered butter, flour, and milk. Place the butter, oil, and chopped garlic in the pan and heat slightly over medium heat. Once the butter has melted, create the roux for the sauce by adding the flour and whisking together with the butter and oil. A roux is the base that will help create the flavorful sauce. Stir things together for at least a minute to ensure the flour has cooked. You can let the roux cook for a couple of minutes to deepen the yumminess, but keep things over low heat – you don’t want a brown, burnt roux! Now add the milk and whisk a bit more until the sauce starts to thicken and start to bubble. Turn off the heat and add the shredded cheese. Keep whisking until the cheese is all incorporated. Give things a taste and add more salt or pepper to your taste. And, just about now, your pasta should be ready for straining. Go ahead and dump into your strainer and let rest for a minute while tossing together the spinach and prosciutto. Place a sauté pan over medium heat and toast up the chopped prosciutto and then add the spinach. Once the spinach has wilted, take it off the heat. Now place that happy pasta in an oven-safe serving dish, cover with the spinach and prosciutto, and then coat with the cheesy sauce. Sprinkle with the extra cheese and broil for a few seconds before serving. A nice, big salad would turn this savory gooey dish into a perfect family dinner!